The 365 Restaurant is situated on a very busy Al Satwa Road of Dubai. It is from this very site, 365 Restaurant has been pleasing people of Dubai with its tempting and mouth-watering Chinese and Filipino dishes. The food offered at this bistro is not only reasonably priced, but is also great value for money, as the portions of meals served at this eating place are also enormous. Deals like all you can eat and buffet have made 365 Restaurant a huge hit. This is why several people come back to this eatery again and again. Guests can also savour the delicacies of Chinese and Filipino food at their home or office by availing their take away service. 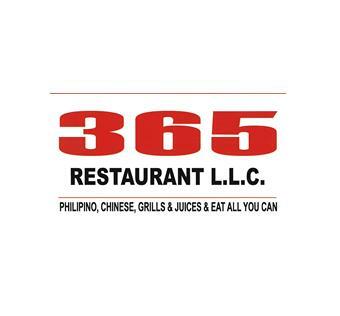 - The 365 Restaurant offers dine-in option for breakfast, lunch and dinner. - The most alluring thing about this eating place is that is offers all you can eat deals. - Guests can also enjoy buffet deals. - Outdoor seating is also available at this bistro, where guests can consume delicious food while watching the panoramic views of the city. - Take away service of 365 Restaurant can be taken advantage by people who like to eat at a private place or office. The 365 Restaurant opens daily and its operational hours last from 10:00 am till midnight during each day of the week. Al Satwa Road – Dubai – United Arab Emirates. 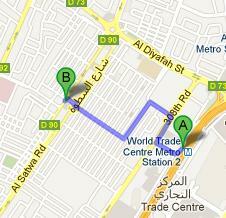 World Trade Centre Metro Station 2 is roughly 1.8 kilometres away from 365 Restaurant. If a person heads from this metro station to 365 Restaurant on feet, he or she can bridge this gap in about 23 minutes approximately. To do so, commuters should head southwest towards 308th Road, then turn right onto 308th Road and afterwards turn left onto 11th Street. After that commuters should turn left onto 26 A Street and this will bring them to another turn on the right that goes onto 19th Street, from where patrons should turn right onto شارع السطوة‎/D 90 and then turn left towards شارع السطوة‎/D 90. Later commuters should turn left onto شارع السطوة‎/D 90 in order to locate the destination on the left. Directions from World Trade Centre Metro Station 2 to 365 Restaurant. Bada'A - Dubai bus stop is about 130 metres away from 365 Restaurant, which makes it 2 minutes walking journey. If a person heads in the northeast direction on شارع السطوة‎/D 90 towards 21st Street, from there the destination is not too far on the right side. Bus numbers 7. 88, 93, C14, C26 and F11 have stops at this bus station. Directions from Bada'A - Dubai to 365 Restaurant.